Abolhasani, F., Amani, M., Aghamollaei, H., Mirzaei, M., Latifi, A. (2014). Simultaneous determination of Zinc and Lead in blood samples by Differential Pulse Polarography. Journal of Applied Biotechnology Reports, 1(4), 171-174. Fatemeh Abolhasani; Mohammad Ali Amani; Hossein Aghamollaei; Morteza Mirzaei; Ali Mohammad Latifi. "Simultaneous determination of Zinc and Lead in blood samples by Differential Pulse Polarography". 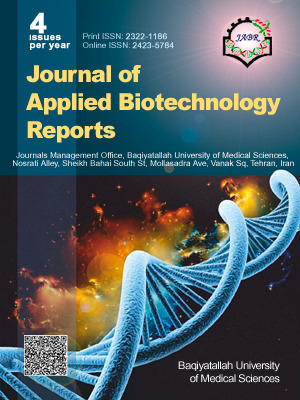 Journal of Applied Biotechnology Reports, 1, 4, 2014, 171-174. Abolhasani, F., Amani, M., Aghamollaei, H., Mirzaei, M., Latifi, A. (2014). 'Simultaneous determination of Zinc and Lead in blood samples by Differential Pulse Polarography', Journal of Applied Biotechnology Reports, 1(4), pp. 171-174. Abolhasani, F., Amani, M., Aghamollaei, H., Mirzaei, M., Latifi, A. Simultaneous determination of Zinc and Lead in blood samples by Differential Pulse Polarography. Journal of Applied Biotechnology Reports, 2014; 1(4): 171-174. In present study we determine the Zinc and Lead levels in human blood samples by differential pulse polarography under optimum experimental conditions (pH=7.5, Scan rate=5mV/S and pulse amplitude=50mV) the polarographic reduction peaks of Zn and Pb were examinedin the -0.72 V and-0.15 respectively. The zinc and lead content can be determined by in comparison with their standard solutions. According to the obtained results differential pulse polarography is more reliable, rapid and sensitive method for determination of zinc and lead levels in the blood than atomic absorption spectroscopy.